The main focus of this report is to analysis the Recruitment and Selection Process of Prime Bank Limited. General objectives of this reports are to evaluate the current recruitment and selection policy and process of Prime Bank Limited. Here also find out the weaknesses of the current policy and to suggest improvements to the policy. Finally this report make swot analysis about the Recruitment and Selection Process of Prime Bank Limited. The recruitment and selection processes of an organization are two of its most important HR planning activities. The basic purpose of recruiting is to ensure a sufficient pool of applicants from which the most qualified individuals may be selected. Effective recruiting is important because sufficient number of qualified applicants is needed to ensure that selection can be successfully accomplished. To evaluate the current recruitment and selection policy and process of Prime Bank Limited. To find out the weaknesses of the current policy. To suggest improvements to the policy. In the backdrop of economic liberalization and financial sector reforms, a group of highly successful local entrepreneurs conceived an idea of starting a commercial bank with a different outlook. For them, it was competence, excellence and consistent delivery of reliable service with superior value products. Accordingly, Prime Bank Ltd. was created and commencement of business started on 17th April 1995. The sponsors are reputed personalities in the field of trade and commerce and their stake ranges from shipping to textile and finance to energy etc. The Prime Bank Limited, being a banking company, has been registered under the Companies Act 1994. The Bank operates as a scheduled bank under a banking license issued by Bangladesh Bank, the Central Bank of the country. As a fully licensed commercial bank, Prime Bank Ltd. is being managed by a highly professional and dedicated team with long experience in banking. They constantly focus on understanding and anticipating customer needs. As the banking scenario undergoes changes, so does the bank and it repositions itself in the changed market condition. Prime Bank Ltd. has already made significant progress within a very short period of its existence. The bank has been graded as a top class bank in the country through internationally accepted CAMELS rating. The bank has already occupied an enviable position among its competitors after achieving success in all areas of business operation. Prime Bank Ltd., since its beginning has attached more importance in technology integration. In order to retain competitive edge, investment in technology is always a top agenda and under constant focus. Keeping the network within a reasonable limit, their strategy is to serve the customers through capacity building across multi-delivery channels. Their past performance gives an indication of their strength. They are better placed and poised to take their customers through fast changing times and enable them to compete more effectively in the market they operate in. PBL closed another solid year (2011) of performance despite internal and domestic shocks in the economy. This solid performance is a testimony of PBL’s creativity, commitment and care for stakeholders. The bank was able to make operating profit of Tk. 3.85 billion in 2008, an increase of 18.11 percent from the previous year. Net profit attributable to shareholders stood at Tk. 1.23 billion. The return in average equity remained 20.58 percent during 2008 and Earning per Share (EPS) stood at Tk. 43.32. NPL ratio is 1.76 % which is slightly higher than that of 2009 but much less than the industry average. PBL made adequate provision against classified loans. Specific provision made is significantly higher than last year. Adequate provision made the bank stronger the before. During the year 2011, PBL made remarkable progress in recovery of loans amounting to Tk. 85 million. Capital adequacy of the bank is 10.88 percent, which is above the stipulated rate of 10 percent. Cost income ration increased to 33.42 percent from 32.37 percent of previous year. The strong performance was contributed from its continuous growth in loans and deposits and good performance by the Merchant Banking and Investment Division (MBID). Deposits of the bank rose by Tk. 17.5 billion during 2009 indicating a growth rate of 24.83 percent. Loans and advances, which are well diversified, have grown by 30.29 percent during last year (2010). To carry on the foreign exchange business, including buying and selling of foreign currency, traveler’s cheques issuing, international credit card issuance etc. From these data, manpower may be estimated through regression analysis (such an analysis is provided in Appendix B). The recruitment goals of Prime Bank Limited (PBL) are to attract and retain highly qualified human resources who will perform best in their respective areas. The bank not only tries to attract well-qualified candidates but also tries to identify and recruit people who are really interested to work in the bank for an acceptable period of time. PBL usually promotes from within the organizations, but when the need arises, the bank also hires from outside for vacancies at all levels. PBL always emphasizes on hiring for a long period of time. The bank tries to attract and select those candidates who will move through the organizational hierarchy to the senior level positions in the future. PBL has developed a corporate culture where employees are not treated as mere employees. They are treated as associates of the bank. Together, they form a family and all associates are the members of the family. Campus recruiting will be handled by the HR Division and the overall planning for this will be done based on the Annual Manpower Plan. However, the respective business department/function requiring the profiles should have the responsibility and mandate to short-list the campus-based candidates. The skill base generally recruited through this route will be entry level positions. Therefore, the plan for campus recruitment will have to tie up with the placement season of various universities that are targeted for recruitment. The HR Division needs to identify a set of campuses based on the courses conducted there, any past experience of candidates from these campuses and the emerging requirements of the bank. Advertising in newspapers, company website etc. The different steps if the selection process is described below in detail. This is the first selection hurdle to join PBL. Candidates either send their CVs in application for a specific vacancy, or they send unsolicited CVs for any suitable position. The HR division collects job applications against each job vacancy. In case of newspaper advertisements, the applicants are given at least 3 weeks to apply. After a specific period, each and every job is closed for applying. The next step is the short listing of CVs. Usually the HR division is engaged in the short listing. But the HR division may delegate this step to the respective divisions (for which the selection is being carried out) to save time. To recruit experienced bankers, CVs may be sorted out from the collection of unsolicited CVs received. Or, another possibility is to find out experienced and competent bankers in other banks. Once potential candidates are thus found out, they are contacted and called for an interview. After the applications are sorted out and a preliminary list is prepared, the candidates are informed and are called for a written exam (for entry level positions) or an interview (for experienced banker for mid level or senior level positions). For written tests, the bank issues admit cards through courier services seven to ten days prior to the exam. The employment test is generally an aptitude test which measures the candidates’ verbal ability, numerical ability, reasoning ability etc. The HR division contacts IBA/BIBM to design and conduct the recruitment tests on behalf of the bank. The HR division provides them with the desired academic qualification and the name of the vacant posts to construct the question paper for the test. The interviews that are conducted are panel interviews and not structured. The interview board consists of the MD, DMD and the Head of HR. Even in the selection of fresh graduates for TA or MT positions, those top level and executive level managers are present. Usually only one interview is conducted for selecting a candidate for a position. But in case of recruiting experienced bankers, sometimes more than one interview is conducted. After the interview is conducted and the interviewees are evaluated, the management committee decides who is to be selected and who is to be rejected. After this final decision, an ‘Offer Letter’ is made for each selected candidate. Once the candidates accept this offer, they are given the ‘Appointment Letter’. The candidates that are rejected are not informed. After the appointment letters are printed, the candidates are given one month for joining. First, the candidates have to go through physical examinations. If the result of these physical examinations is satisfactory, then the candidate is eligible to join the bank. After the physical examination, the candidate needs to bring the result of the medical tests along with all the necessary documents and academic certificates for joining. After going through the formal joining and placement process, the candidates are finally employees of Prime Bank Limited. The employees of the bank shall be classified designation as shown in the above illustration. Any change, addition, in the classification and designation shall required prior approval of the board. An employee of the bank, other then an officer appointed to a particular category of the position shall continue in the same category. Provided that if he fulfills such condition as may be down in this behalf, he may be appointed to another category of posts by the competent authority. No position shall be appointed to any post in the service of the bank unless he is a citizen of Bangladesh. Provided that the may in special cases, waive this condition subject to fulfillment of the to employment of foreign nation in Bangladesh. A candidate shall not be less then twenty years more then thirty years of age at the time of appointment direct recruitment as a probationary Officer and not less than eighteen years and more then thirty years of age at the time of appointment by direct recruitment as a probationary employees other then an officer in the service of the bank. Provide than the board may in special cases, relax the upper age limit for reasons to be record in writing. No person shall be appointed in the service of the bank unless he is declared physically fit by the medical officer or the bank or any other Medical authority specified by the bank in this behalf. The service of provision or temporary employee shall be liable to termination by the competent authority without assigning any reason after giving him one months notice in writing or on payment of on more substantive pay in lieu of such notice and the probationary or the employees shall not be entitled to any form of composition for termination of services. Personnel Management is by far the most important element of an organization. This is particularly true for a service organization like a commercial bank. Progressive companies pay special attention to recruitment, selection, training, orientation, evaluation, promotion and compensation of Executives, Officers. The success of a commercial Bank depends largely on the quality of services rendered to the clients. Quality depends on the competence and the quality of the Officers and Executives. Prime Bank Limited believes in paying competitive salary and emoluments to its employees and to get maximum services out of them. Therefore, the authority of the Bank has to be careful in recruiting the right person for the right job. It should be the duty of the Managing Director along with the top Management to analyze the manpower requirement of the organization every year and fix up the number of Officers, Executives and other employees of each category required for effective operations of the Bank. The Board of Directors on the recommendation of the Management will be the supreme authority to sanction or to create additional post. Creation of a post implies commitment of fund for about thirty years. Therefore, it is the responsibility of the management to examine the work load and do the job analysis work and to look into the real requirement of employees under various categories and to see whether an additional hand is really necessary. Prime Bank must recognize the importance of manpower estimation and accordingly an organogram should be prepared for Head Office and for each Division & Branch. The organogram shall however, not be rigid, the Board may review and revise the organogram as may be considered necessary from time to time. Recruitment will be made to fill up the vacant posts as and when required by the competent authority as per power delegated by the Board. Recruitment to be made for the required post, which has to be determined & approved by the Board at the beginning of each year, either through inviting application from prospective candidates or through talent hunting. CBCS will start with the recruitment of potential Management Trainees (MTs) fresh from the recognized & Prime Bank listed Universities. With MT concept in place, normally, there will be no recruitment at the Mid/Senior level management position except in special circumstances to meet dire needs. MT’s career progression and development will be closely monitored and ensure growth in the succession ladder up to future TOP leadership positions in banking. Employees/Executives in ‘core banking cadre’ with professional competence & background may move to the ‘banking support services cadre’ in the event appropriate positions in the job grade ladder are available to meet business needs. Inter – bank transfer and between Head office & banks both in core banking jobs and banking operation services jobs would be the common phenomenon. Since ‘banking operation jobs’ are of routine, repetitive and clerical in nature, in this segment, our recruitment sourcing will start with Trainee Assistant (TA) concept fresh from Universities. Operation jobs are normally confined between TA and SO job grade in the operation cadre service. Employees with mediocre potential are the target group for recruitment. Only employees with extraordinary achievements in job grade SO, may be considered up to PO/EO job grade through interview process. An employee in SO job grade, if found ‘Very good’ (VG) or ‘Excellent’ (Ex) for last 3 consecutive years coupled with strong behavioral competence & knowledge, will qualify for promotion interview to the next job grade of PO. Same principle will apply for employees move from PO to EO level. However, not more than 15% of the total population will be considered for next promotion from SO to PO or from PO to EO level at any given point of time. Inter- cadre transfer only in operation jobs across the functions would be considered. There are two segments of jobs in BSSC i.e. Operation Jobs: ranging from TA to PO/EO level where employees will be limited in terms of potential. Executive Jobs: starting normally with potential ‘Probationary Officer’ with requisite job requirement & competence fresh from the recognized & listed Universities. MT at times will be recruited sourced through the recruitment process in the ‘Core Banking Services Cadre’ within policy. Executive jobs will also be manned through recruitment from the market, candidates having required professional experience, competence & background as well as through internal transfer of professionals from the ‘Core banking Cadre Service’ depending on the availability of resources. Normally no transfer from BSSC to CBCS would be considered. However, executives having core banking professional competence may be transferred to CBCS in the event positions are available in job grade ladder and the bank management considers it fit and appropriate to do so in the interest of business. High potential executives may move up to SEVP level / functional heads in BSSC. Through press advertisement in at least 2 (two) national dailies. Directly through talent hunting but not more than 50% of the yearly recruitment/requirement under this grade. Every candidate who applies in response to the press advertisement shall have to appear at a written test & appear before the Selection Committee for an interview. Candidates who are selected by head hunting will have to appear before the Selection committee for evaluation. Typing speed: 40 words per minute (For Type/Telex/Computer – MS Word) & 25 for other categories of Computer operation. Interview evaluation sheet in respect of each candidate will be in place considering all the factors above and will be put on record. TA(s) will pass through an evaluation process during probation. A separate ‘Performance Evaluation Form’ will be in place. Minimum G+ would be desired rating for confirmation as AO job grade. For the TA(s) who will score less than G+ rating, the probation period may be extended for improvement not exceeding 06 (six) months or may be terminated. Subsequent growth in career limited to PO/EO level will depend on the job performance and demonstration of skill, knowledge & behavioral competence. MT will pass through a period of probation for 2 years and on successful completion of probationary period will be confirmed in service according to category as shown above. Performance Appraisal and interview by the MC will be conducted at least a month before completion of 24 months and only VG & Excellent rated trainees will only be confirmed in substantive positions. Subsequent career progression depends on Performance, Potential & Merit of the individual candidates. Performance appraisal and interview by the management committee will be conducted at least a month before completion of 24 months and only VG and E rated trainees will be confirmed in substantive positions approved by MD within policy framework. a) Recruitment through Press Advertisement: Every candidate will appear for a written test. The subject matter of test should be general knowledge, Arithmetic, English, Economics/ Banking as may be decided by the Management from time to time. For this purpose Prime Bank Limited may take the help of outside experts for setting the questions, supervising the examination work and marking the scripts. A candidate must secure minimum 60 % mark in written Test to be eligible for VIVA/interview as Management Trainee. They will be recruited based on performance in interview with the Selection Committee. b) Recruitment from the Interns: They will be recruited based on their performance during internship period, evaluation report of their supervising officials and performance in the interview with the Selection Committee. However in no case more than fifty percent of the interns will be eligible for appointment. Interns selected under this criterion should join within one month of completion of his course. An internee who has completed his internee more than six months ago will not be eligible under this criterion. The appointment will be made according to requirement on the basis of a panel to be prepared in order of merit by the Interview Committee and after approval of the competent authority. While interviewing the candidates for final selection, due weight should be given on the educational back ground, professional excellence and technical skill in the appropriate field. Prime Bank will pay focused attention to develop its own manpower through training process. It must, however, need quality human resources to run its operations and expansion program through continuous training and development strategy. Recruitment of experienced Bankers from other Banks will however, continue till such time MT process is geared up in core banking leadership positions. Accordingly, as per requirement of the bank experienced Executives/ Officers may be appointed from time to time strictly in accordance with the job profile of the positions. After proper scrutinizing of the application received from the eligible candidates, they will be interviewed by the Management Committee. The Management Committee should ensure that the minimum qualifications, experience and competence required for a given job is rightly matched. Exceptions may, however, be made in case of extra ordinarily capable candidates. This means that for such cases educational qualification may be relaxed and similarly length of experiences may also be reduced considering candidates’ special training and experiences in particular field of banking business. The cases of selected candidates will be placed before the competent authority for approval. There will be no probation period for experienced Officers/Executives who join from other Banks, if their services were confirmed by their earlier employers. The bank will prepare “Job Profile” against each job available in the job grade ladder covering three service cadres in functional areas and all recruitments will be made according to the respective job profile. There will be a separate “Job Profile Manual” for the bank to be maintained and followed for recruitments. In case of candidates having high potential, not more that one job grade up in the job grade ladder will be considered. Human Resources planning are the first stage of an effective recruitment and selection process. It is not only a matter of satisfying the present HR needs of an organization, but also an activity that influences the shape of the organization’s future. The recruitment and selection is quite fair and square. Everyone at the HR Division is honest and impartial which promotes the environment of accountability. Internal growth creates an attachment between the employees and the organization. Moreover, internal growth has increased the recruitment and selection efficiency of the HR Division, since it has better knowledge about the applicants’ knowledge, skills, abilities and other qualifications. The recruitment and selection process of PBL emphasizes more on who fits the organization, rather than who fits the job. Thus, it has created a unique organizational culture and the whole HR Division has ensures a friendly and caring working environment. PBL’s HR planning can be made more effective if it is revised more often according to the change in this fast moving industry. Statistical measures such as correlation analysis and regression analysis are not applied to predict and analyze the recruitment and selection requirements more precisely. Quantitative methods are not practiced in determining utility in recruitment and selection. There is no feedback system established to find out the efficiency of the system and correct its drawbacks. No study is conducted to justify the effectiveness of the recruitment tests. Regret letters are not sent to the candidates who are not selected after joining of the finally selected candidates. PBL does not always check references properly, which may lead to a grave problem for the organization. Among various aspects of the bank, which of the following aspects did you consider most? Are you happy for the recruitment process of the Prime Bank? Does the Prime Bank follow recruitment process? What is your opinion about the recruitment process of the Bank? What is your opinion about the formalities that the bank provides for recruitment? How much time, it takes to call after submission the application? Are you satisfy that terms and conditions of the Prime Bank? What your view about the behavior of the employee when you are entry level officer? Do you think that any limitation of Prime Bank for getting job? To give chance for the meritorious student by reducing personal selection. Time should be reduced for the candidates after submission the application. To reduce terms and condition for entry level officer. To ensure validity of the job. Technological advancements: Prime bank has equipped its branches will all major IT tools in the industry like ATMs, fax machine, photocopies, printers, latest computers and good connective architecture. Hoe ever it has been observed that when its time to work, there are many facilities seen in the different devices used by prime bank. Especially its connectivity architecture and remains office with the main server, that creates problems to the customers. 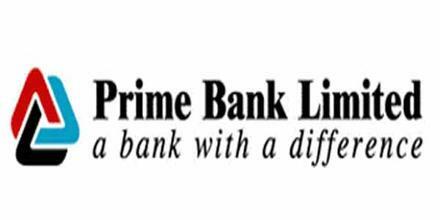 Job Advancement: There is no advancement procedures for lower staff members or junior executives that have join recently at prime bank. The main problem was observed that the lower staff should be trained about the operations of the bank and also the junior should be given promotions by defining the criteria’s like performance etc. Training and Developments: There are effective training centers of prime banking Bangladesh. The problem with Training and Development is that it is only available for the high level officer and not for lower staff members. Lack of employees in some departments: Although prime bank is very good employer of talent professionals at different branches, however it was observed that there were some departments in the bank lacked the number of professional in that resulted in efficiencies in that department. Amenities at Branch: Providing amenities like separate room for prayers because the currently of employees pray in the conference room of the branches. Also separate room should be made for the account department for storing of the vouchers at it is done in the conference room. Incentive Schemes: There is no scheme for employees for prime bank. Like scholarship schemes for employees want to push higher education. Prime bank although give a number if incentives that want to push higher education. Prime bank although give a number if incentives to an employees, like personal loans at normal markup but they are only provide to employees that are in higher ranks. Education fees are also returned by prime bank to its employees after having finished their studies. Several recommendations for the existing recruitment and selection policy and procedure are described here. PBL should start taking CVs online and gradually stop taking hard copy CVs altogether, at least for fresh graduates who are candidates for entry level positions. This will significantly reduce the time needed is sorting the CVs. It will also facilitate the maintenance of a database of CVs of potential candidates for future reference. Also, it will save a lot of time and automated regret letters may be sent with much ease. The bank should maintain a database of CVs of all applicants, which would be easier if applying online is encouraged. PBL may also maintain a separate database of candidates who have been selected. From this database it will be evident after a while, which university graduates are more suitable for the jobs in PBL. Because, it can clearly be seen which graduates are doing better during the recruitment and selection process of the bank. From then on, PBL can target and advertise only in those universities and institutions for candidates. The CVs received through the sourcing process is firstly screened by the HR Division to determine a fit against the job specification. Screened and short-listed applications should then be forwarded to functional heads to draw a short list for the recruitment exam or interview. A final short list should be drawn up by the functional units/departments and forwarded to the HR Division; enclosing short-listed and rejected CVs. Rejected CVs of possible future interest could be sorted in a database. But this is not done in PBL. Once a CV is rejected, no record of it is kept. Based on the short list received by the HR Division, letters to the short-listed candidates should be issued specifying a date and time for the interviews. Instead, the candidates are called on the phone for the interview. Although this probably saves cost, it has other disadvantages, e.g., it is very time consuming. The practice of sending letters to the candidates should be started. Currently, the validity of the written exams is not being tested. PBL should find out whether their written exams are valid, that is, whether the tests measures what they claim to measure. The written exams for the entry level positions are usually cognitive aptitude tests which measure a candidate’s verbal ability, numerical ability, reasoning ability etc. But such tests do not assess an applicant’s ability to perform his/her job properly, that is, whether he/she has an understanding of the duties and responsibilities of the position for which he/she is applying. That’s why ‘job knowledge tests’ may be used along with the existing aptitude tests. A primary advantage of a job knowledge test is that it is by definition job-related. A test for any specific organizational job can be designed based on the data gathered from an in-depth job analysis. These tests may require written responses; they may also be orally administered exams. These tests should usually consist of a few key questions that would distinguish the qualified from the unqualified. An assessment center is a selection technique for identifying management potential. In assessment centers, potential candidates are subjected to different exercises constructed to simulate the job for which they are applying. Candidates participate in a series of activities similar to those they may be expected to encounter in the actual job. These activities may include management games, leaderless discussion groups, mock interviews and other simulations. A team of assessors observe and evaluate the participants. Both Job knowledge tests and assessment centers can evaluate how a candidate will perform in the actual job. PBL should think about introducing assessment centers as one of its selection tools. Many candidates have unrealistic expectations about a prospective job or employer. These wrong perceptions can have negative consequences later for an organization if such candidates are hired, e.g., job dissatisfaction, absenteeism and turnover. To correct this situation, PBL should provide a clearly written job description to the candidates as well as a realistic job preview before recruitment so that the candidate can have a clear picture about the job he/she is going to take and the organization he/she is going to work for. A realistic job preview should convey both positive and negative aspects of the job and the organization objectively and in an unbiased manner. Reference checks should be done only for candidates who have been approved by the recruitment panel for the job. Reference checks should be carried out for all potential permanent employees. This is important in order to verify information and ensure that the organization is aware of any serious problems in the candidate’s past. There are several different background checks that can be done on potential candidates. 2. Criminal record These are recommended for positions which involve close, unsupervised contact with the public, e.g., any type of position that is considered to be “security sensitive”. 3. Past employer(s) This should be done on all new employees. In order to get the most in-depth and useful information about the candidates, it is necessary to contact the supervisors and the HR Division of the applicant’s previous organization. 4. Personal reference This usually consists of references from friends, relatives or coworkers. This type of reference check should never be used as a substitute for no. 3. But these are often not done in PBL. The HR Division should carry out two reference checks for every potential permanent employee prior to the final appointment. The interviews need to be made more structured, which would contain only job related questions and each question will have a specific answer. This way, the interview will be more reliable, objective and fairer. Also, it is a common practice in PBL for the MD and DMDs to be present in the interview board even for interviewing candidates for MT or TA. This wastes their valuable time. The fresh candidates can be interviewed by more junior level executives. Lack of training is a serious interviewing problem. PBL does not provide any interviewing training for its managers. Because of this lack of training, goals are not set for the interview, the wrong questions are asked. , the right information is not secured, biases are not controlled, poor selections are made etc. PBL should start training its managers on better interviewing techniques. PBL should strive to reduce this high rate of turnover by recruiting effectively. There has been policy violation of the recruitment and selection policy in terms of criteria and procedure violation. For example, it is against the policy to recruit interns from universities that are not in the list given in the policy. But the graduates of such universities that are not listed in the policy are being recruited as interns. Also graduates from listed universities but not having the required CGPA are also recruited as interns sometimes. These sorts of policy violations occur as a result of requests of high officials. An example of procedure violation has been going on for quite some time. That is there were no written exams being held for recruiting TAs until very recently. The success of a commercial bank depends largely in the quality of service rendered to the clients. Quality of service depends on the competence and the quality of the employees of the organization. Therefore, the authority of PBL has to be careful in recruiting the right person for each job. As has been seen, the recruitment and selection process of PBL has rooms for improvement. The policy and process should be revised. So although the process they have been adopting so far has been somewhat effective, to adapt to the changing times, the process should be revised and streamlined.